Artists, at the beginning, learn by imitation, right? As the end-credits rolled on my first viewing of Raiders of the Lost Ark—I think I was about thirteen—I was seized by an urge to invent my own action hero. Indiana Jones awakened me to the possibilities of a new kind of adventure storytelling, one that didn’t rely on superpowers or spaceships. I called him “Jeremiah Smith.” (Even the name was an imitation, syllabically.) I quickly sketched out storylines, a cast of characters, a crisis, and a whole lot of unlikely action sequences. My typewriter clattered and pinged until I’d piled up a stack of stories, each one longer than the last—wilder, more convoluted, more extreme. My hero had his distinctive qualities. He had wisecracking sidekicks so he’d have someone to talk with along the way. He went up against mad villains bent on global destruction. He charmed women wherever he went. He chased McGuffins around the globe. And he had a sharp, snarky sense of humor. In short, he was everything most boys, in their vain and self-serving fantasies, want to become when they grow up. Ethan Hunt is the summer’s greatest action hero. But what kind of hero is he? I wrote a lot of these stories. I still have them here in a drawer in my home office. They humble me. They remind me of how susceptible I was, even in a context of strict evangelical Christian community, to “secular” ideals: I wanted to grow up to be someone people adored as a superman. I wanted treasure. Weapons. Sidekicks. I wanted the adoration of women. I wanted fame. Sure, I’d imagined my guy as a globetrotting Christian missionary to give myself a sense that he was a Good Man doing God’s Work. But the result was a weird hybrid: I wanted a hero who saved the world with good punching and good shooting, spectacularly humiliating his enemies while also maintaining an aura of holiness. I wanted the glamour of worldly heroes with the justification of the church. Today, those homemade stories of typewriter ink, crayon drawings, and staples, are not very meaningful to me… beyond their nostalgia factor, anyway. But I can remember clearly that the primary pleasure of writing them had nothing to do with winning souls for Jesus, or for engaging in vicarious violence. No—it was something else, something more along the lines of architecture: It was the work of imagining high-speed chases, narrow escapes, and traps for catching villains. That was its own reward. It carried with it the same kind of joy that I imagine puzzle-makers and computer coders feel when all of the pieces suddenly fit together to achieve an unlikely result. It is, I imagine, what a coach feels when he trains a team to execute a play to perfection. You’ll notice that I gave up writing adventure stories. Something was always missing. I didn’t know how to bring the series any stakes or any soul. Like other action heroes, Jeremiah Smith’s luck was constant, so that no matter how heavily I stacked the deck against him, he survived. He always won the day. These stories all seemed too easy. They lacked something that made the exploits of my favorite adventure icons so rewarding. What was missing? What was this magic ingredient that could make an adventure story so satisfying? Read The Lord of the Rings. Watch those original Star Wars and Indiana Jones movies. You’ll see it. The greatest adventures aren’t about whether or not the heroes win. They’re about what the character learns. They’re about a greater design than even the character understands. The heroes in these stories fail sometimes. They’re reliant on others. They’re humbled, but their imperfect efforts serve—and, ultimately, glorify—a goodness greater than themselves. I came to appreciate that if a story is all about a hero’s superiority, strength, and righteousness, it will have, at best, the shallowness of wishful thinking, and, at worst, the harmful delusion of idolatry. Let’s talk about Ethan Hunt. 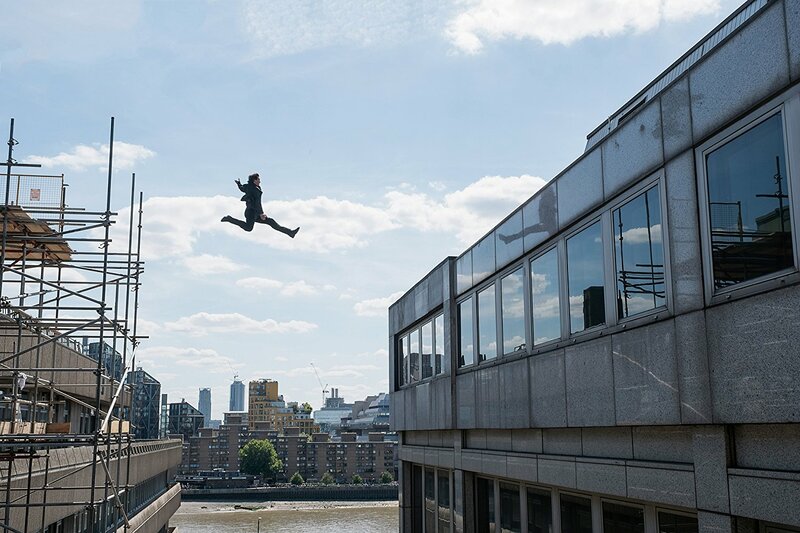 Ethan Hunt: Does he make the jump from rookie agent to Great Hero? Then came the fourth and fifth: Brad Bird’s Mission: Impossible— Ghost Protocol (2011), and Christopher McQuarrie’s Mission: Impossible—Rogue Nation (2015). These were much more fun than the first three. They kept jacking up the Wow Factor of the stunts and fight scenes. And the characters were, at last, somewhat engaging. They established memorable chemistry, the primary hero, Ethan Hunt (Tom Cruise), and his new IMF (Impossible Mission Force) sidekicks—Luther Stickell (Ving Rhames) and Benji Dunn (Simon Pegg)—improvising their way through ridiculous challenges. And they avoided the dulling influence of digital effects, keeping us grounded in the work of humans and hardware in front of a camera. But even those films failed to give me a reason to care. I felt like I was watching movies made by people who—like me in my early teens—really liked the great adventure films, and, in a spirit of enthusiastic imitation, had learned how to choreograph excellent action sequences. But they hadn’t found the secret to making the stories matter. So the skyscraping raves for Mission: Impossible—Fallout published over the past several weeks raised my hopes. Would this movie—the first to bring back a previous director—McQuarrie—live up to the hype? Would this one finally influence more than my adrenaline? Would it make me care? Upon exiting the only opening-day showing of Fallout I could find in Roswell, New Mexico, in the company of about a dozen moviegoers, I shared the crowd’s buzz. In that adrenaline afterglow, with the outstanding Lalo Schifrin theme ringing in my ears, I felt a rare satisfaction: I had seen a great summer movie. 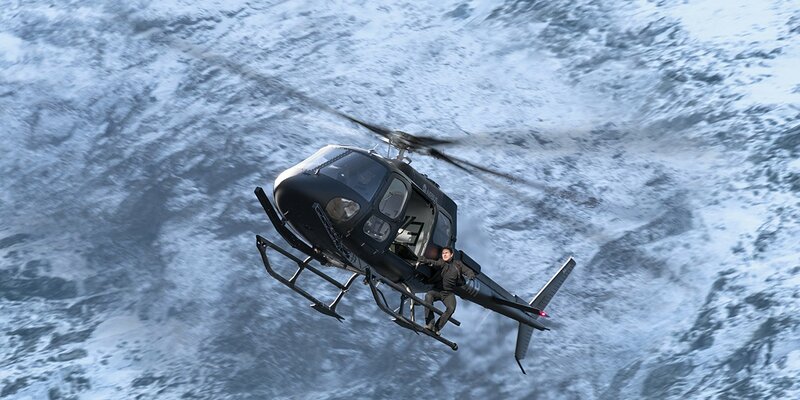 Can Ethan Hunt fly a helicopter in pursuit of a villain and catch him? Take a wild guess. I’d seen the IMF team strive to save the world from a nuclear holocaust. I’d witnessed death-defying stunts. I’d seen one of the most wildly unlikely and breathtaking chase scenes, involving car, trucks, vans, motorcycles, and more, in a whirlwind tour of Paris. I’d seen a first-rate cast achieve engaging chemistry. I’d seen (I had no doubt) the very best installment in a franchise two decades old. Yeah, you’ll hear the same thing from me that you’ve already heard from others, and that you’ve probably said yourself: While Fallout’s narrative is unnecessarily (even desperately) complicated, and some of double-crosses are eye-rollingly easy to guess, the movie relentlessly delivers awe-inspiring thrills: a dizzying skydiving sequence, a vertiginous helicopter chase, and a traffic chase as ludicrous as it is exhilarating. (Rebecca Ferguson on a motorcycle here is about as close as live-action can come to the brilliant biking of Elastigirl in Incredibles 2.) I’m almost embarrassed that McQuarrie could suspend my disbelief through a scene in which Tom Cruise chases a vehicle through a city on foot… and gains on it. The glow lasted a couple of days. I’m still eager to see the movie again, but no—nothing here has raised the bar for the Mission: Impossible franchise. Ethan Hunt remains far, far short of greatness as a character. We know he strives to save the world and to serve America’s best interests. But why? What are his deep motivations? What does he believe in… besides himself? 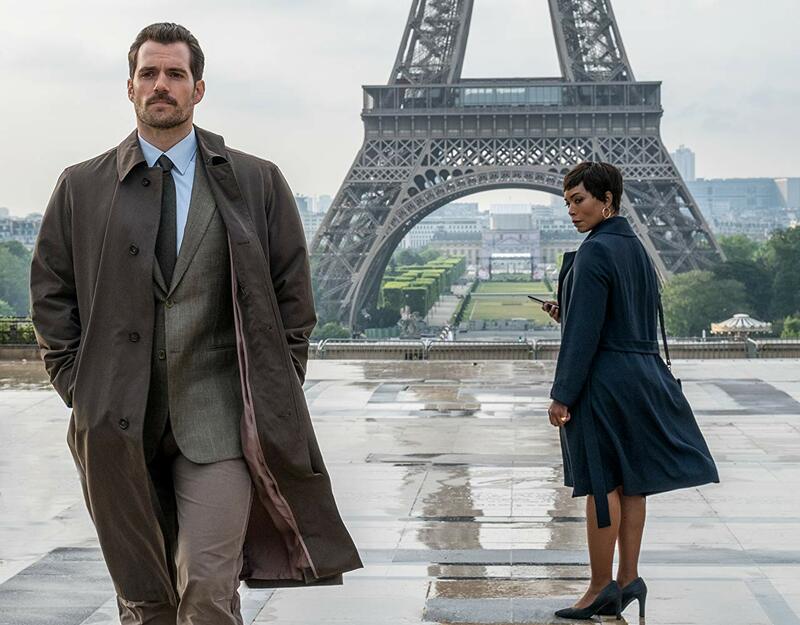 Henry Cavill and Angela Bassett in Fallout: Guess which one gets big scenes. These questions have become an itch I haven’t been able to scratch. Imagine chugging an energy drink that makes you feel like Superman for several days, but that then leaves you with a faint, annoying headache for the next two weeks. I just cannot shake a lingering feeling of irritation with Fallout. And, the more I think about it, the more I’m beginning to see the whole series, in retrospect, as significantly flawed. The problem, I think, is that the hero has too much in common with the actor. Ethan Hunt is the perfect role for Tom Cruise. 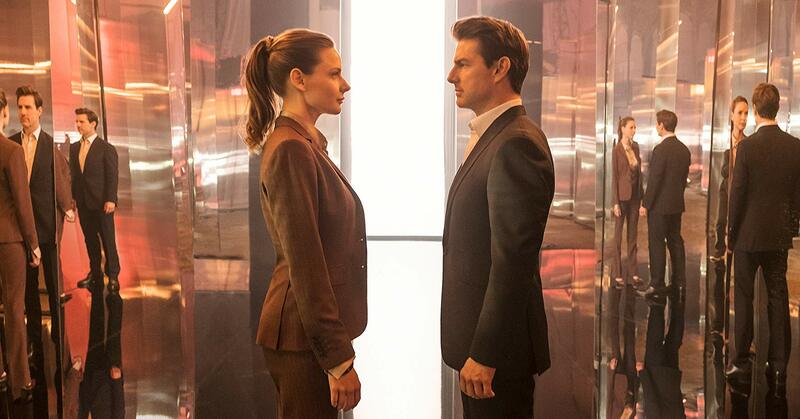 While I prefer Cruise in the roles of guys who think they’re brilliant but obviously aren’t (think Jerry Maguire, Magnolia), or—even better—in the roles of villains with salesman smiles and vacuous interiors, I think Ethan Hunt is the role Cruise was born to play because I cannot imagine an actor so dedicated to remaining in peak physical condition, capable of fighting, driving, flying, and especially running in a way that makes him the most believably talented superhero in the movies. We believe Hunt can jump from one building to the next, climb cliff walls and skyscrapers, and steer a helicopter at high speeds through jagged mountain peaks to catch and fight someone in another helicopter… because Tom Cruise can do those things. That’s actually him onscreen jumping, climbing, and piloting aircraft. I don’t know anyone else who can do that. Rebecca Ferguson rivals Elastigirl for Best Motorcyclist of the Moviegoing Year. But here’s the thing: Ethan Hunt is a superman in the most unsettling sense of the term. With the exception of Brad Bird’s episode in this series—Ghost Protocol, a film that stands out by playing up the fallibility of the characters and their technological tools—the Mission: Impossible series is a recurring demonstration that Hunt can do anything. He wins. Again and again. We’re meant to be relentlessly and increasingly impressed with him. This series is, more and more all the time, designed to make us amazed at the glory of Ethan Hunt. He’s the big screen’s Six Million Dollar Man… adjusted for inflation. Considering Tom Cruise’s unwavering devotion to Scientology, we might smell something rotten in the state of this franchise. Hunt’s lack of character—he’s so consistently one-dimensional that he makes Indiana Jones seem Shakespearean—keeps us focused almost entirely on a physical specimen. Look at how special he is. For Skywalker and Solo, the story’s about the apprehension of The Force that “binds the galaxy together.” For Indiana Jones, it’s not about his unbroken record of achievements—no, he fails all the time: It’s about encounters with awe-inspiring wonder that ultimately humble him. For the heroes of The Lord of the Rings, their feeble fellowship only achieves a victory in their embrace of cooperation, humility, and sacrificial love (and even then, there are heavy losses). Great hero stories are about going with them into some kind of revelation, in the service and realization of some greater glory. Ethan Hunt movies are about looking at him. And in Fallout, the series’ adoration of its superman goes to unsettling extremes. One of Hunt three adoring women in Fallout. Second, there’s the way Hunt knows better than any government, any superior officer… anyone. 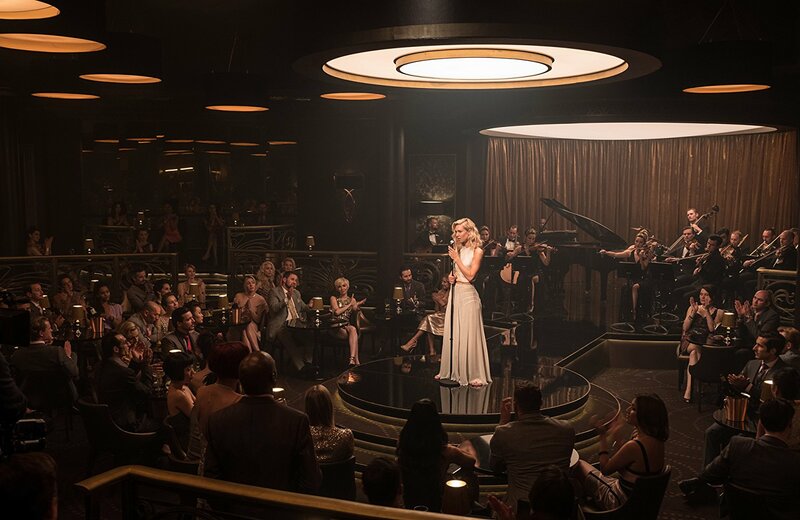 (This film even humbles an agent played by the famously full-of-himself Alec Baldwin, making him more loyal to Hunt than the law or any fellow agent.) Hunt’ shunches are always right. His priorities are always perfect. He’s almost always one step ahead of everybody. Third—look at his team, how they believe in his ability to achieve the impossible, how they speak in hushed amazement at his derring-do. Fourth (and most upsettingly): consider the fact that both African American characters in the film end up bowing at the feet of the Greatest American Hero. Near the end of the film, Luther, Hunt’s most reliable backup, is given a scene where he gets teary-eyed in reverence for his superior. I felt sorry for Ving Rhames, a great actor who deserves to dominate movies of his own. Vanessa Kirby plays The White Widow, another woman with lips hungry to kiss Ethan Hunt. Perhaps McQuarrie and Company mean nothing by this. Perhaps it’s all a blockbuster joke to them: setting up such a preposterous hero and, with dazzling sleight-of-hand, making us believe. Maybe they’re intent on distinguishing Hunt from other famous white-guy heroes by making Superiority his calling card. But in 2018, I just can’t take this lightly. Some of you will think I’m taking this too far, but I can’t help it—I read the news. And if I were a white supremacist and/or a male chauvinist, thinking that the world needs a corrective that worships the muscular white male American as the ideal Human, I would love this movie. I would see a hero who confirms my self-interested, racist inclinations. If I believed that Might-Makes-Right, I’d cheer for a hero whose might is always right on, without getting distracted by matters like “the greater good.” If I disbelieved in God or any kind of Higher Power, I would be pleased to see a hero who can save the world with speed and strength and fists and double-crossing. And so I’m a bit ashamed at how completely I was drawn in to Mission: Impossible—Fallout, leaning forward in the hope that Ethan Hunt save the world in full view of his adoring fans. Yeah, the movie’s a lot of fun. And I still intend to see it again to enjoy the technical mastery on display in these action scenes. But I won’t be able to ignore the not-so-subtle idolatry, and the justification of everything he does. Looking around at a world fraught with prejudice and injustice that is driven by that particular false hierarchy, I see the fallout every day.